We are pleased to announce the launch of our first StyleTotal Android app. Now you can navigate our guide to Buenos Aires fashion shops anytime, anywhere, on the screen of your phone. 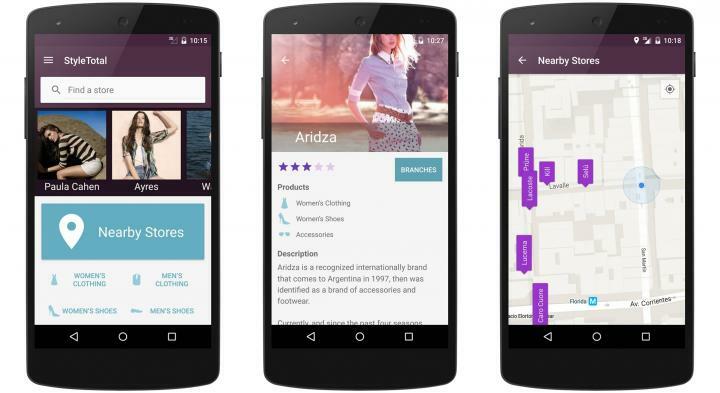 The new StyleTotal app for Android helps your shopping experience of clothing, accessories and fashion products in the city of Buenos Aires and its surroundings. Browse stores by product type or search your favorite fashion store and find all its branches. The Nearby Store Finder displays all stores that are near your current location. We hope you like our app. If you have any suggestion about this app you can leave a comment here or use the contact form. The StyleTotal app is available free on Google Play and it's compatible with all devices using Android 4.0.3 or later.